Be very proud of yourself and all you have achieved. One of your guardian angels is holding your golden sash and guiding you along in life. 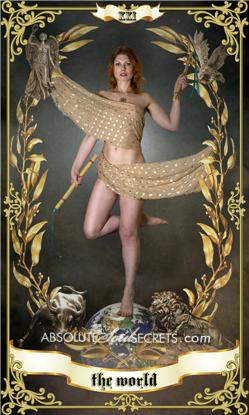 The World tarot card wants you to know that you will have success in both your inner and outer worlds. Things that you have been dreaming about or striving to achieve are within your grasp. You may be about to receive an award of some kind… it could be special recognition when you complete a course of study, or an award in the workplace for high achievement. It is well deserved. You will be an inspiration to others and could be asked to be a mentor to young women to help them achieve their goals. Travel overseas is on the cards for you. While travelling, you will make some wonderful connections. You could even meet the partner of your dreams! This person is likely to be mature, balanced and extremely successful. This relationship will be very happy and long lasting.